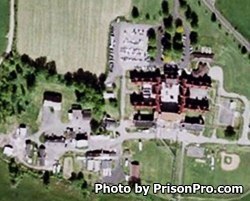 Wallkill Correctional Facility is located in Ulster County New York. It is a medium security prison that houses adult males. Wallkill has the capacity to detain 606 inmates, and is one of the few facilities that does not contain a Special Housing Unit. This facility participates in the Correctional Industries program which allows select inmates to work in an optical shop, learning how to manufacture and inspect eyeglass lenses; in order to be eligible for this program the inmate must have a diploma or GED and agree to stay in the program for at least ten months. Wallkill Correctional Facility also offers vocational training in Horse Handling/Care, in building maintenance, and Horticulture. Inmates can receive alcohol and substance abuse treatment services during their incarceration. Visits at Wallkill Correctional Facility occur on Saturdays, Sundays and Holidays from 7:30am-2:15pm. Visitors processing ends at 1:50pm. Inmates are limited to three visitors per session and up to four visits per month.